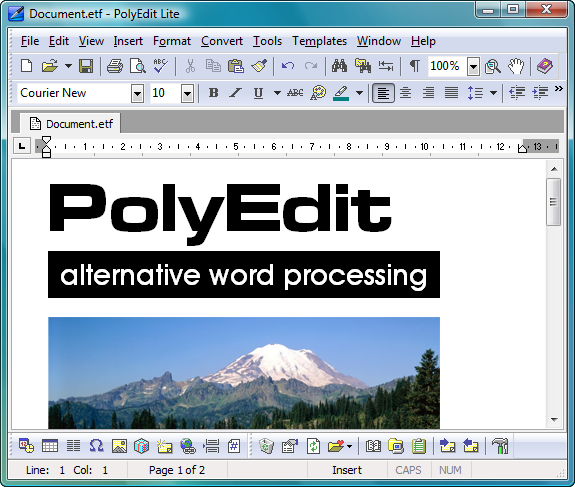 PolyEdit Lite is a free word processor that is designed to be lightweight, reliable, easy-to-use, and extremely fast. It has all of the standard capabilities you expect from a word processor. The program also introduces some innovative features that will make your work more efficient. 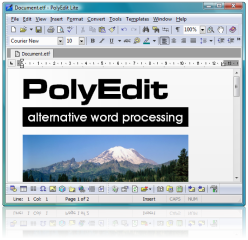 PolyEdit Lite lets you handle a wide variety of word processing tasks. It is a great replacement for both WordPad and Notepad. And in many cases the program can replace even big-name word processors such as MS Word and WordPerfect. Click the button below to download the latest version of PolyEdit Lite. Spelling dictionaries for the word processor can be found here. You can download and try the full version of PolyEdit before you buy it. Download the full version of PolyEdit now! Purchase your copy of PolyEdit today!